In February 2006, he was offered a scholarship with the Canaries to commence in August 2007. .Declan made his debut for the England Under-16s in December 2006 playing in a 2-1 win over Scotland that gave England the Victory Shield. Declan became the first Canary to play at the new Wembley when he played for England Under-16s against Spain on 28th April 2007. Declan came on for the second half and helped preserve a 1-0 win with a save in the very last seconds of the game - all in front of a crowd of more than 28,000. Commenting on the new national stadium, Declan said It is really unbelievable. To play there for an England team - I just can't find the words to describe it properly. To be the first Norwich player to play there is such an honour and one that I will never forget. I used to watch Norwich every week when I was younger so I was very proud." Declan was called up in September 2007 to play for the England Under-17s in a four team tournament where England came second, and where Declan played in a 6-1 win over Northern Ireland and a 3-0 win over Italy. He was then called up to the England's Under-17 squad for their UEFA Qualifying Group in Estonia from 21st to 27th October. He will be contesting the number one jersey with Wesley Fotheringham who was in Korea for the U17 World Cup Finals in the summer. In addition to the hosts, England face Malta and Portugal in the group with two countries going through to the next stage. 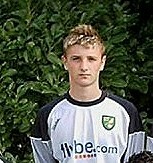 During 2008/9, Decaln proved himself the hero as Norwich beat both Stoke City and Everton on penalties with Rudd saving shots to propell the young Canaries to victory in the FA Youth Cup. Declan made his first team debut on 26th September 2009, coming on as substitute in the 1-1 draw at Gillingham following Fraser Forster's sending-off. He finished the season with 8 appearances as City won the League One title. In July 2010, Declan played in goal as part of the England Under-19 team that reached the semi-finals of the European Under-19 championships in France, before losing 3-1 to Spain. In September 2011, Declan was called up to the England Under-21 squad. He also made his Premiership debut, coming on against Chelsea at Stamford Bridge after John Ruddy was sent-off. He played a total of 4 games in the Premiership during 2011/12 but missed a large part of the season through injury. In June 2013, he travelled to Israel as part of the England Under-21 team that flopped so miserably at the UEFA Under-21 European Championships. He signed a contract extension, to 2015, with Norwich on 18th June before rejoining Preston the same day on a season-long loan. Preston reached the play-offs but lost in the semi-finals to Rotherham. Rudd became Norwich's second choice keeper in 2014/15 but only made two first team appearances. He made 14 appearaneces in 2015/16 including a run of 11 games in the Premier League following a loss of form by John Ruddy. On 2nd August 2016, Declan was permitted to join Charlton on a season-long loan, and was replaced by Paul Jones at Carrow Road. Charlton were without a senior goalkeeper following the departures of Stephen Henderson, Nick Pope and Marko Dmitrovic this summer. His form for Charlton saw them linked in April 2017 with a permanent move for Rudd in the summer of 2017 whilst Preston were also reported to be keen. He made 40 appearances for Charlton. Norwich activated a one year extension to Rudd's contract in May 2017 following the announcement that John Ruddy would be leaving the club. On 15th June 2017, it was reported that Norwich had agreed a £1million fee with Preston for Rudd, whose chance of being first-choice at Norwich was made less likely with the season long loan signing of Angus Gunn. he ended up signing for Preston on 20th June 2017 for an undisclosed fee with Rudd signing a three year contract.